I’m always looking for exemplary informational mentor texts. When Under the Freedom Tree crossed my desk, I knew I found one I wanted to share with you. It’s the story of the first contraband camp during the Civil War. Even though my college minor was American History (with most of my coursework focused on the Revolutionary and Civil Wars), I don’t recall learning about Fort Monroe, aka: Freedom’s Fortress. Therefore, I was captivated by this true story told in free verse by Susan VanHecke with illustrations by London Ladd. I wanted to learn more about this book since it’s one I will recommend to teachers when I speak about mentor texts. Besides learning about an aspect of runaway slaves I didn’t know about, I appreciated this book since it’s where poetry meets informational writing. Therefore, I interviewed Susan VanHecke about the creation of Under the Freedom Tree. In addition, I talked with her about her writing process. As always, I hope you enjoy her interview and will excerpt it when you use this book with your students. Q: What drew you to the story of Frank Baker, James Townsend, and Shepard Mallory? Why write about the residents of Slabtown and Grand Contraband Camp? A: When I stumbled across the story of the contraband slaves, I was amazed that this incredible history happened just a few miles from my home. The location where Frank, James, and Shepard made their escape from the Confederates and rowed by moonlight to the Union line is just steps from my local grocery store. The fortress where the Union general made his landmark decision to defy the Fugitive Slave Act and deem the runaways “contraband of war” so they wouldn’t be returned to their masters still stands by the busy highway. 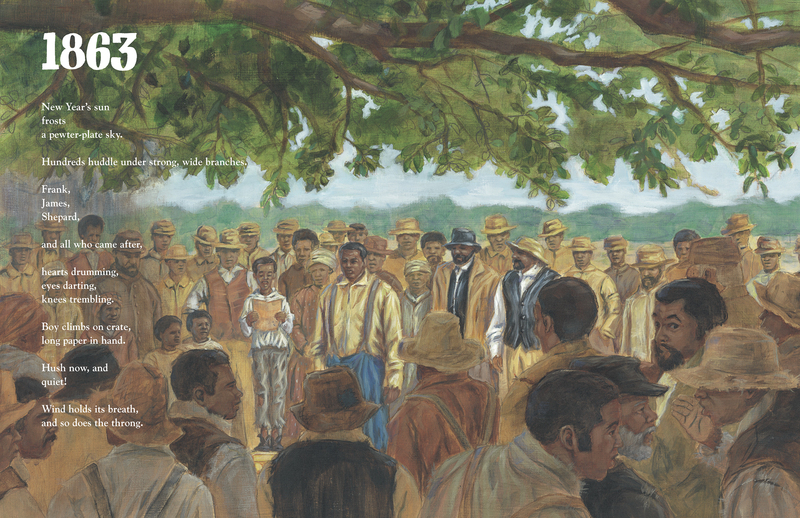 And without even knowing it was there, I’d driven countless times past Emancipation Oak—the enormous tree under whose branches contraband slaves learned to read and write and where they heard the Emancipation Proclamation guaranteeing their freedom. I realized how easily rich, exciting history can be overlooked in our fast-forward, modern lives, and how important it is to preserve, protect, and learn from it. Those first contraband slaves, who built their own communities of Slabtown and Grand Contraband Camp, give us a fresh, new view of the journey to emancipation. 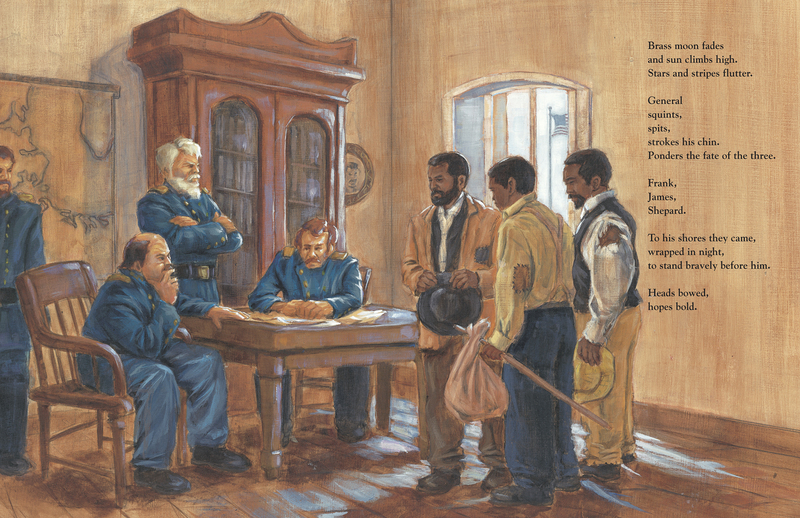 Contrary to the “classic” version of events, freedom was not simply conferred upon slaves by the white man’s Emancipation Proclamation; African Americans were bold, brave, proactive participants in the struggle for freedom. I wanted my kids and their classmates to know about this amazing story. Q: Why did you choose to write about this topic as a free verse poem? A: Actually, I struggled for a couple of years to write this story in prose. But it just didn’t feel right; it was too dry, too flat. Then I ran across a collection of speeches and essays by the late children’s writer Virginia Hamilton. I was fascinated by her concept of “rememory,” what she called “an exquisitely textured recollection, real or imagined.” Imagine a recollection? How would that work? It all came together when I visited Emancipation Oak on the campus of Hampton University. Standing under those sheltering branches, the light filtering through the leaves, the air quiet and magical, I could feel those emotions, that drama, of those wartime events near and beneath the tree. The words began to flow; the “rememory” presented itself as poetry. 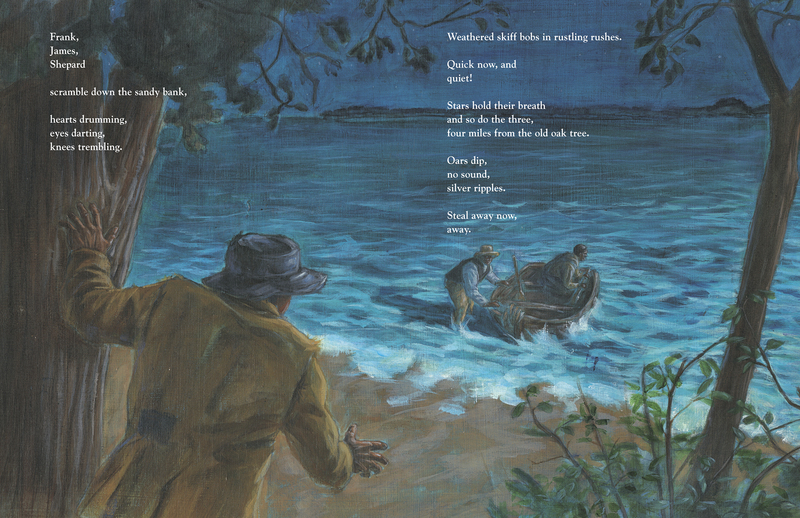 Q: I see Under the Freedom Tree as having use beyond a read aloud during Black History Month. How do you envision teachers, specifically writing teachers, using this book in their classrooms? A: You can find a comprehensive Educator’s Guide aligned with Common Core standards at www.underthefreedomtree.com. It includes pre- and post-reading discussion questions, historical sequencing and matching manipulatives, and compare/contrast and storytelling activities designed to get students in grades 2-4 thinking about the people, places, events, and issues in the book. There’s also a great Readers Theater script at the website as well. For writing teachers specifically, the book offers many opportunities to explore the use and power of figurative language (metaphor, onomatopoeia, alliteration, imagery, personification), repetitive phrasing, and symbolism. Q: Under the Freedom Tree is an excellent mentor for students who wish to write about a time period or event as a free verse poem (rather than a traditional essay). What is some advice you can give to writers who would like to write about a historical event or person as a free verse poem? What are some of the challenges? A: It might be helpful to keep Virginia Hamilton’s words in mind: “exquisitely textured recollection.” Ask yourself what textured writing means to you. For me, it means diving in with all five senses. So imagine that you’re living through the event or time period. How do things look? What do you see, smell, hear, touch, taste? Now, how could you best describe that so others can vividly imagine they are there too, living it right alongside you and your characters? Probably the greatest challenge is doing enough research to figure out those important sensory details. For instance, while writing Under the Freedom Tree, I needed to know what the shoreline along Hampton Roads harbor was like in 1861, since it’s mostly residential, commercial, and military development now. So I visited protected wetlands in the area that have been allowed to evolve naturally. There, I heard the rustle of the reeds and the slap of the waves, and I felt how the sandy bank gave way under my feet. Another example: To describe the Union general’s facial features, I needed to track down a photo of him. In the images I found, he looked to be scowling and his eyes reminded me of an owl’s, so I worked those elements into the text. Q: Tell us about your research process. A: I do a ton of research before I ever start writing. I hunt down as many primary sources as I can, and I scour libraries and the Internet for as much documented secondary source material as I can find. As I read and learn and read some more, sooner or later a story will start to emerge. If I’m lucky, I’ll even begin seeing some patterns. For instance, I learned in my research that the contraband slaves did for the Union army almost exactly the same things they had done for the Confederates: dragging, hauling, digging, stacking. So I included that repetition in the poem. That got me thinking about other elements that could enhance meaning if they were repeated, like the adrenalin-fueled reactions during the slaves’ escape from the Confederates and their “escape” from freedom when hearing the Emancipation Proclamation. I also look for some unifying theme or image or motif that might anchor the story. In the case of the contraband slaves, it occurred to me that all these incredible events took place very near or right at the tree. So I used the tree as a sort of axis around which the story could revolve. A: I’m fascinated by the stories of people’s lives, so I write a lot of biography. And I love the enhanced storytelling possibilities of the picture book, with its highly visual component. So I’ve been hard at work on several picture book biographies of various artists and musicians. In the meantime, the fine folks at Charlesbridge will soon be publishing my picture book biography of Mexican bandleader and stereo sound pioneer Esquivel, whose wildly innovative, out-of-this-world music is just great big terrific fun. 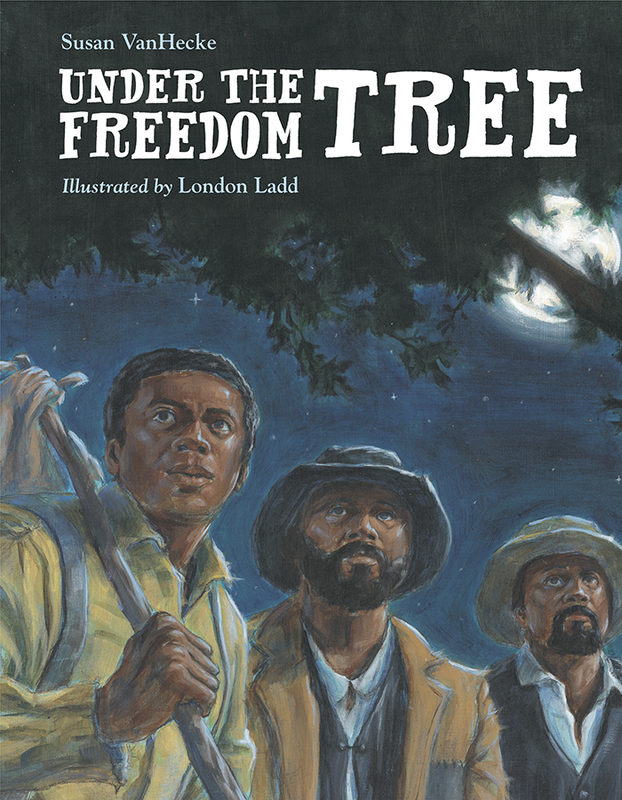 This giveaway is a copy of Under the Freedom Tree by Susan VanHecke and London Ladd. Many thanks to Charlesbridge for sponsoring this giveaway. To enter for a chance to win a copy of Under the Freedom Tree each reader may leave a comment related to this interview, writing free verse poetry, or Black History Month. All comments left on or before Thursday, February 27th, 2014 at 11:59 p.m. EST will be entered into a random drawing using a random number generator on Friday, February 28th. I will announce the winner’s name at the bottom of this post later that day. NOTE: Anyone living in the Continental U.S. is eligible for this giveaway. This looks like a great book. Thank you for the interview. I have already visited Susan’s website! Thank you for sharing this interview. I was particularly fascinated by the research the author conducted. I hope I can share this fascination with my charges. I love teaching my students to write free verse poetry. I find that it can be based on their experiences or on a topic on which they have a wealth of knowledge. This book would be a great beginning for that knowledge base. Glad to know about this book and loved reading about her process! It looks like a marvelous book. I love that there are parts in the interview that I can share with students about the research. Even in poetry, which students often think of as less work, the author needs to have great background knowledge in order to do the work well. Thanks for all, & the chance to win a copy! Thanks for bringing this book to my attention and the wonderful interview by the author. SO nice to see that there is some nonfiction poetry out there and that it’s been researched and relevant. It’s easy to find funny and silly poetry, this is a great resource! I loved this interview, especially reading about how the author does a lot of research before even writing her book. I think this would be very interesting or students to know about. This interview and book…comes at just the right time for me as I’m selecting books for my next class at the University. I love the poetry … amazing and will be so fantastic to weave into our curriculum. Thank you for this fabulous interview also. The students will be also interested in her research process. I am presently working with new teachers on how they can help students answer text based evidence questions when reading informational text. This book would be an ideal text for me to use when I model various strategies for them. I love books written in verse, and so do my students. I can’t wait to share this title with the 8th grade history teachers (who teach US History). Now I wonder what secrets of history lie just around the corner in my neighborhood. This book is rich with instructional opportunities, not to mention a great book to recommend to a classroom history buff. Thanks for the book specifics and the interview. An important part if my unit on HF is pairing picture books that match the time period they are reading about. This book will be a fabulous addition. I also am a tremendous fan of books in verse and am always looking for a way to expose children to ways to write about their NF in beautifully crafted ways. I can see many uses for this book as a mentor text. Thanks also for the great interview. It’s wonderful to be able to share a writer’s process and advice with students. This is a beautiful book and one I would like to consider for the Keystone Book Award list. I’m excited to check out this new resource. Thanks for sharing!!! Thanks for introducing this amazing book. I am so attracted to books written in verse. I am fascinated by the word choice which has to be just right. I also enjoyed hearing the author’s process. The road from idea to publication is a long one with lots of challenges and rewards. This book is beautiful.This happens to be part of the new 5th grade curriculum in our diocese, so its a wonderful addition to our unit of study. I love that Susan has gone into great detail all the work that goes into writing. Many students don’t realize how much writers put into these books they share. Thanks for sharing!